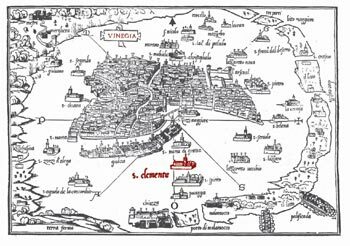 ABOVE: San Clemente is the red island on this antique map of the Venetian Lagoon. If you have a high-speed connection, see the full-size map (565K). INSET: Private hotel launch; sign on dock; Alilaguna airport boat. Boats depart from a slip by the Giardini Reali or Royal Gardens, just to the right of the Piazzetta (the waterfront section of the Piazza San Marco) as you face the water. Look for the octagonal Water Taxi booth next to the stone balustrade, then look to your right for the small wooden San Clemente Palace sign. If you don't see a boat, wait by the balustrade until the next launch arrives. If you're coming from Venice's Marco Polo Airport, take the Alilaguna Alilaguna airport boat and get off at the San Marco Giardinetti stop. Turn right as you leave the boat landing and walk to the far end of the sidewalk in front of the palace gardens, where you'll find the Water Taxi booth and the San Clemente Palace boat dock.